Continued from Part II, "The Chase." On September 26, the Baltimore Orioles and Boston Red Sox reconvene at Fenway South, Oriole Park at Camden Yards, to send this season screaming back to Hell. Tommy Hunter starts for the Orioles; Josh Beckett, again, for the Sox. Each man allows two runs through five innings pitched; then Hunter pulls his groin. He makes it through the fifth but is pulled for former Houston Astro Troy Patton. Both Patton and Sox reliever Matt Albers came to Baltimore in the trade that sent Miguel Tejada to Houston; Albers was allowed to leave in free agency after the previous season. Patton was an intriguing starting prospect for the Orioles, until he tore his labrum twice. Now he's the most middling of middling relievers. Nevertheless, he gets out of the top of the sixth without allowing a run. He has, in fact, looked almost impressive over the past few weeks. Beckett takes the mound in the bottom of the sixth and the game spirals delightfully out of control. Guerrero takes the first pitch up the middle for, yes, another seeing-eye single, with which he passes Julio Franco on the all-time hits list for Dominican-born players. With a strong second half, he's been an important contributor in the Orioles' resurgent September. As transitory as such success is, the Orioles can always use something to be happy about. On the very next pitch, Wieters actually tries to bunt for a base hit as the Sox put on the shift. It barely goes foul. Jim Palmer shakes his head—you can almost hear him doing it—as the Sox stand pat and don't adjust their defensive formation. Wieters drills a ball to center; Ellsbury is there. Jacoby Ellsbury is an MVP candidate; he's had a homeless Brady Anderson's 1996. Thirty home runs, most of them liners and just-barelys. Guerrero "steals" second: the ball is in time, but catcher Jarrod Saltalamacchia throws hard toward the first base side of the bag, and second baseman Dustin Pedroia is unable to catch it and tag him. Palmer snickers at the balding little gnome and says, "Short arms.... You can see Pedroia try to catch it and drop the glove; good throw gets him by a mile, but again, you can see just off the base and then, well, if you were a little taller, you would have a little longer arms to tag him." Somehow, Guerrero is now 2 for 4 in stolen bases. This would be a good time to take advantage of the man on second. Instead Jones, who has otherwise had a very nice season both at the plate and in centerfield, strikes out. Guess where the pitch is. Reynolds comes to the plate. Jim Palmer about the Orioles: "Do they walk enough? No. Do they strike out too much? Yes. On base percentage? Lower than you'd like. But they do attack the baseball." Reynolds exemplifies one of his three true outcomes and walks. Then Chris Davis appears and just as quickly lines a pitch down the right field line; it's a one-handed double into the right-field corner. Reynolds holds up at third. The Orioles take the lead, 3-2, and have men on second and third with two outs. And now, Andino. He is actually Robert Andino, Jr. Tonight, his father, Robert Andino, Sr., is in attendance. This is the first time that he has seen his son play a game of professional baseball. The cameras cut to him once or twice. He looks happy and overwhelmed. Again, Ellsbury is an MVP candidate. He's had a good if unsustainable bat this season. His power tool is grossly overstated, but here's the thing: he's still actually hit thirty home runs. He has. It's been ridiculous. However, a lot of his value this year comes from his defense, and in previous seasons that defense was, gently put, overrated. 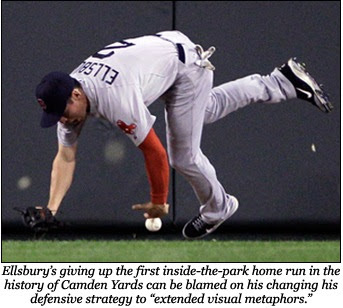 Ellsbury took bad routes to balls on the fly but was able to make up for it with his speed. This year, he's actually looked like a good centerfielder; it complements his scary power surge. 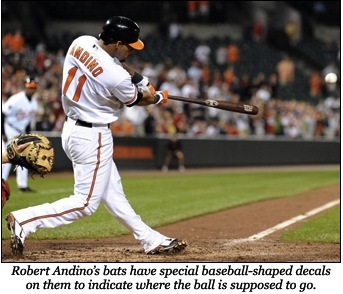 That makes what happens on the second pitch of Robert Andino's at-bat in the bottom of the sixth so amazing. The Baltimore second baseman burns a deep fly to center. Ellsbury retreats on it at a dead run, and Ellsbury is fast. He reaches it. He gloves it. He hits the wall, and he drops it. Ellsbury flails beneath himself for the ball while Andino rounds second. The Sox centerfielder finds it, picks it up and throws it back in, hitting cutoff man J.D. Drew in shallow center. Andino heads home. Drew's throw is a beauty, but it short-hops Salty. Andino's dead to rights: he doesn't even slide. The ball arrives when he's still six steps from the plate, but it skips past Salty and on to the backstop. In front of his father, who watches him play professional ball in person for the first time in either man's life, Robert Andino becomes the first Oriole to hit an inside-the-park home run in Camden Yards. The Sox score a run in the ninth. No one cares. The Orioles win 6-3. The wild card race is now tied. As the second to last game of the season approaches, Boston fans ask what to do for Game 163—the play-in. When two teams are tied for the single wild card berth in either of the leagues, they play a loser-goes-home game. They've happened a lot recently, so much so that the league is making them an official part of postseason play. Boston frets because they do not have someone to start this game. Ace Jon Lester will pitch the last game of the season on three days' rest. Beckett just lost last night. Who throws in the elimination game? Lackey? Wakefield? The early answer is "Chris Capuano." Word comes out Tuesday morning that the Sox are looking into acquiring him from the Mets, as he's cleared waivers. Nothing develops by game time, and the Sox go to war with the rotation they have, not the rotation they want. Bedard starts against Britton. The Sox win this game 8-7. They even keep the dreaded Andino off base, but Aceves and Papelbon have to throw a combined 4 and 2/3 innings to do so. Papelbon only gets the final out when Jones grounds out to Lowrie at third, with runners at the corners and two away, after Papelbon's 28th pitch. Both men should be unavailable for the next game—unless the next game happens to be the last, an all-hands-on-deck emergency that makes or breaks team morale, narrative and most importantly, playoff revenue expectations. The Rays win their game against the Yankees. The wild card race remains tied. Plans go forth for Game 163 if necessary, but every last dollar and moment will be decided Wednesday, September 28, 2011, starting at 7:05 PM. Remember Bruce Chen? No? That's fine. Once upon a time, back in the Bad Old Days, he was a touted young Orioles pitcher. Right now he's a starter for the Kansas City Royals. Somehow, he's not even bad, even though his fastball reminds one a lot of Matusz's: 86 mph and straight. Unlike Matusz's only remaining pitch, his confounding "leftball" is dragging this Royals "ace" to a marginally respectable record. The Chicago White Sox can't hit him at all. Boston allegedly tries to trade for Chen all throughout the day. Nothing comes of it. They only have so long to get him on the team, and he only really matters if the Sox lose Wednesday. As first pitch approaches and a deal can't be made, the Sox resign themselves: if they force a Game 163, the starter will be from their Major League roster. God save the Boston Red Sox, because now no one else can. He almost does. Wednesday night starts poorly for the Orioles and the Rays. The Orioles are down 3-2 by the time the game goes into a rain delay. Lester's not sharp, but Alfredo Simon is even less so. The Rays, meanwhile, spot the Yankees seven runs in three innings thanks to Mark Teixeira being the guy New York signed him to be. Baltimore/Boston resumes as New York/Tampa enters the bottom of the ninth inning. By now 7-0 has turned into 7-6. The Yankees get the first two outs before Dan Johnson homers to right to tie the game. The Rays have pulled off one of the most amazing comebacks in sports history—so long as you don't mind that the best Yankee pitchers were simply not available. Why would they be? What would the Yankees gain from throwing Rivera instead of Cory Wade? That game goes into extra innings; back in Baltimore, the tarp comes off the field. Things proceed almost uneventfully for a time. Then Papelbon takes the mound. It's the bottom of the ninth inning in Maryland now, after midnight. The Rays and Yankees enter the twelfth at Tropicana Field. Jones leads off. Does he strike out on a pitch low and away? Why yes, he does. It’s a fastball. Right now, the Sox are outhitting the Orioles eleven to four, and Sox pitching has retired six Orioles in a row. Buck Showalter leans against the dugout railing and stares out onto the field. What, me worry? Reynolds stands in, looking like a homeless, murderous Scandanavian. He strikes out. No one is shocked. Red Sox color commentator Jerry Remy is a smug, ridiculous cartoon character in the booth. Two out, Davis at the plate. Davis is not a regular major league starter. He's a project player, a guy you hope can learn to recognize pitches better, learn to harness his power, learn to—Davis doubles again down the right field line, again late on the pitch. Who cares? He's on second. Showalter immediately replaces him with speedy outfielder Kyle Hudson. Reimold steps to the plate. He rocks like a serpent, eyes unblinking. He lays off a few tempting outside pitches. He swings and misses on a fastball at the letters moving in to out. The cameras show Andino swinging the bat on deck. There's no reason for this but expected masochism. The count is 2-1 when Red Sox play-by-play man Don Orsillo mentions that Andino is on deck. It's all right; the Orioles are down to their last strike. Reimold just swung and missed again. This fastball was over the plate. Now the Sox faithful in the Camden Yards stands get loud. He’s caught a little bit more of the plate. The heart of the plate. Reimold swings and ruins Papelbon’s season. Ellsbury and Drew run 20 feet toward the wall in right-center and watch the ball one-hop an ad. Hudson scores easily from second, tie game. Andino walks to the right batter's box. The Orioles are down to their final out of the year. The theme of this series is that Andino is not actually a good hitter; so far tonight has borne that out. He has two groundouts and two strikeouts. He is precisely the sort of guy you pinch hit for in this situation, but even if someone was available Showalter wouldn’t pull Andino. Reimold takes his lead off second. Papelbon throws a ball, then a strike. The Baltimore utilityman calls time, moves away, walks around a bit. Jonathan Papelbon takes his foot off the rubber and stares down towards home. Andino adjusts his helmet and steps back in. Next year, the Orioles will not have an ace. They will not have a legitimate #2 starter. They will have Britton, Arrieta and a prayer book. And Kevin Gregg and his goggles. No one else will take them. Jim Johnson, their only good reliever, will remain in that capacity. They should make him a starter. They're afraid of what will happen to the bullpen if they do. Really, no one knows who "they" will be. Not Andy MacPhail or Brian Cashman. It might be Showalter himself, if he decides the dugout isn't where he wants to be. Showalter holds more power in the Orioles organization than any manager since and including Earl Weaver. It's as bizarre as it sounds: he gets to pick his own General Manager. The insanity in Baltimore’s front office continues unabated. Jones and Wieters will be one year closer to free agency. The bullpen will be staffed by Rangers minor leaguers. The Orioles will still have no actual third basemen. Yes, somewhere down the line, the Baltimore Orioles could again play baseball in October. It is not against the rules. The possibility endures, however theoretical, absurd, and eternally five years away. But it will not be next year. Back in the ninth, Jonathan Papelbon's 1-1 pitch hangs, and Robert Andino swings. He hits it sharply, pulls it in the air between third and short. Carl Crawford charges from medium deep-left and falls into a slide.